The winter of 2010/2011 was characterised by, amongst others, lectures of the chairman, Bert Biemans. On 8 February 2011, he gave a lecture about the Golden Age at the Lionsclub Alblasserwaard in the Groote Sociëteit in Gorinchem. On 16 February, he gave a talk in Hotel Gorinchem for the Gorcumse Open Tafel about a painting by Aert van der Neer, born in 1603 in Gorinchem, that was acquired by the Golden Age Team for the Gorcums Museum. On 23 March, Annet Ardesch and Bert Biemans visited the TEFAF (the world’s leading art fair) in Maastricht, at the invitation of ABN AMRO MeesPierson. There, they went looking for paintings made by artists who were born in Gorinchem. They found works from Aert van der Neer, Jan Olis and Gerard van Kuyll, amongst others. On 11 April, during a board meeting of the Golden Age Gorinchem Foundation it was decided that Mr. Rob Kreszner will leave the Golden Age Team. He will become an advisor of the board of the Foundation. At this meeting it was also decided that the Foundation’s website will be translated into English. On 15 April, the Golden Age Team attended the farewell lecture of Professor Eric Jan Sluijter, Professor of Art History in the early modern time at the University of Amsterdam, which was given in the auditorium of the University at the Spui in Amsterdam. Afterwards, some important contacts were made at the farewell reception in the library. On 10 May, the Golden Age Team bought a magnificent painting by Joachim Govertsz Camphuysen, born in Gorinchem in 1601. 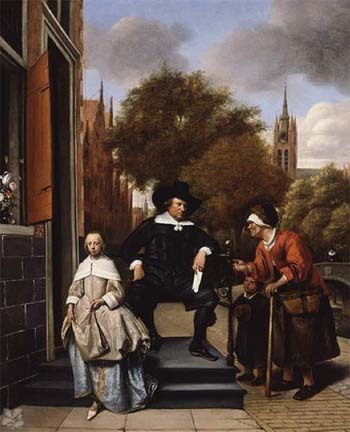 The painting was acquired for the Golden Age Gorinchem Foundation at an auction of Old Masters at Sotheby’s Amsterdam. 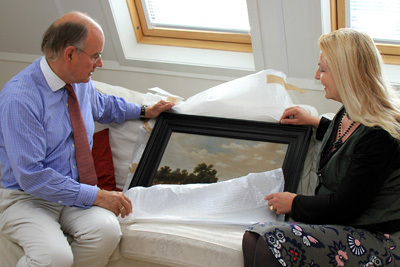 This is the first painting that has been bought by the Foundation itself and that has been given as a long term loan to the Gorcums Museum. The financing of the painting was largely made possible by the Rabobank, region Alblasserwaard Noord en Oost. On 24 May, a large article appeared in the magazine De Stad Gorinchem. In an interview with Annet Ardesch and Bert Biemans the acquisition of the painting by Camphuysen and the importance for Gorcum’s community were extensively discussed. 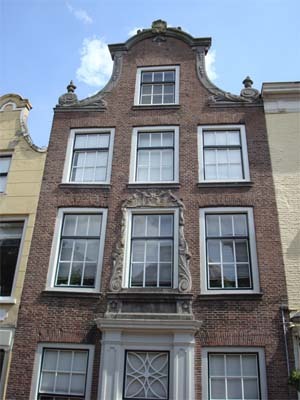 The house of birth of Joachim Camphuysen in the Molenstraat 29 was mentioned. The building still exists and at the moment a barbershop is located at the ground Floor. The unveiling of the painting by Camphuysen will take place on 24 June by the mayor of Gorinchem and the director of the Rabobank Alblasserwaard Noord en Oost. It was important to buy this work because Joachim Camphuysen and Aert van der Neer have known each other. Both painters even worked on the same piece in 1633 which was signed by both as well. Therefore, the paintings by Camphuysen and Van der Neer will hang next to each other in the Gorcums Museum. The archivist of the Regionaal Archief Gorinchem en Omstreken (Regional Archive Gorinchem and Surroundings), Mr. René van Dijk, has investigated the place of birth of Aert van der Neer. 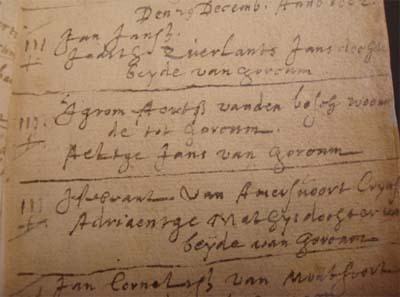 Van Dijk found the marriage certificate of Van der Neer’s parents and this shows that they had their banns published on december 29th 1602 in Gorinchem. The three vertical stripes in front of their name prove that a few weeks later they were married indeed. Van der Neer’s father’s name at that time was Aegrom Aertsz van den Bosch, but he called himself Van der Neer later. His mother was called Aeltge Jans van Gorcum. Apparently, a change of name was not uncommon in that time: the father of Jan van der Heyden was first called Goris and only later Van der Heyden. When Aert van der Neer was born, in 1603, his parents lived in Gorinchem. This proves once and for all that Aert van der Neer was not born in Amsterdam but in Gorinchem. Marriage certificate of the parents of Aert van der Neer.